The China-initiated Asian Infrastructure Investment Bank (AIIB) has seen a rush of applications for membership, before the deadline of March 31. 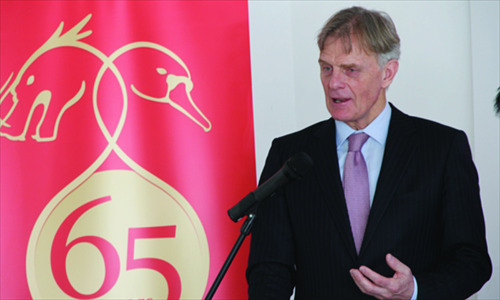 Global Times (GT) reporter Wang Sining interviewed Danish Ambassador to China Friis Arne Petersen (Petersen) on Denmark's application filed to become a founding member of the AIIB and the role that the bank is expected to play in the future. GT: Could you tell us why Denmark wants to join the AIIB as a founding member? Petersen: Joining the AIIB is in line with the national interests of Denmark, and in accordance with Denmark's long-term global commitment and obligations. On a yearly basis, Denmark gives away some $2.5 billion, or 0.84 percent of its GDP to development assistance programs around the world. As a Nordic country, not only do we have an outbound assistance system, but we also have great economic and political interests in Asia. During the past seven or eight years, Asia as a whole has been contributing positively to the world economy, against the backdrop of economic recession and downturn pressure in much of the rest of the world. There is a positive influence on the economy from Asia, and it can be even bigger in the future. The AIIB can provide the region with a great amount of new economic growth opportunities, and thus it is of great importance to Denmark. GT: Which countries are Denmark's friends in Asia? Petersen: We have very big bilateral trade and investment flows with many Asian countries, and that should continue and grow. It is of great interest to Denmark. Denmark has also frequently cooperated with countries like China, Japan, South Korea, Thailand, Indonesia, India, Afghanistan, Pakistan, Myanmar, Malaysia and Vietnam. There are really many new opportunities, and Danish assistance has been present for a long time. GT: What kind of role will Denmark play after joining the AIIB? Petersen: We hope that in the process of the creation of this development bank, together with all the other countries, we could reach a consensus around accepting these high governance standards and sustainability in infrastructure development. It is important to secure a development bank that also counters corruption. So this could be a state of the art of new development bank in the international architecture. I believe the AIIB will rise to be among the world's top organizations and the Danish government will try to help make that happen, together with other founding countries, and agree on the articles for the bank in a very open and transparent consensus-seeking process. As the Danish ambassador to China, I am happy to see that so many countries in and outside Asia have shown interest in creating and participating in this new development institution. We will use all our experience of development assistance administration for the last 50 years in Asia and Africa. We have a long track record of seeking poverty eradication, which is the overarching target for our development assistance. That should also be a strong feature of this bank.